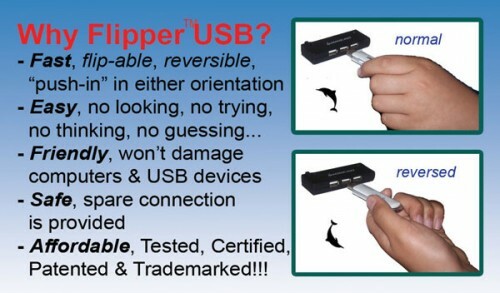 Flipper USB Solves A Problem You Didn't Really Care About | OhGizmo! Announcing The Winner Of The Moshi Lifestyle Voice Control Bluetooth Car Speakerphone! I love how people go so far out of their way to fix a problem that barely exists. Take for instance the Flipper USB. It’s a new male USB connector that can be plugged in upside down. This means that instead of having a 50/50 chance of getting it right the first time, you’ll always insert your USB device correctly. This could potentially save you a whole second, perhaps even two! Alright, perhaps I’m being a bit cynical this morning. I’m pretty lazy myself, and if I weren’t the kind of geek that memorizes the direction that all of his USB devices should be plugged in, I’d probably like this sort of thing. The real question is whether or not this design will ever actually get picked up by manufacturers. I could definitely appreciate this. I've had to deal with two machines that are exactly identical except for their USB ports. Call me lazy, but it'd save me a second of frustration. I doubt it will be picked up. Any one single company trying to redesign a standard always fails. It won't be picked up, but I strongly disagree with the cynicism of this blog entry. I'm always jamming my keys the wrong way, so yes I do care about this issue.